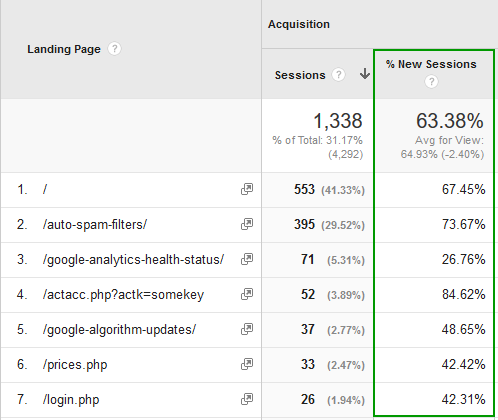 These direct sessions are not that different from our organic traffic, right? Tons of new users in the direct segment – this can’t be all from prior users and bookmarks! 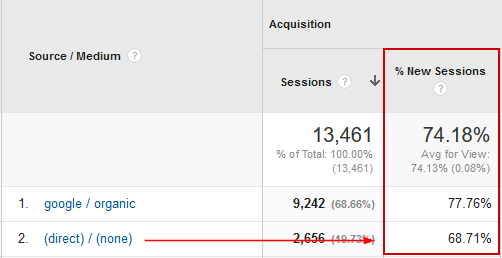 In order to understand what “direct / none” in your Source / Medium report really is you need to know at least a bit about the technical side of how Google Analytics is able to say where visitors to your site come from. How does Google Analytics recognize referrer sources? The Referer[sic] request-header field allows the client to specify, for the server’s benefit, the address (URI) of the resource from which the Request-URI was obtained (the “referrer”, although the header field is misspelled.) The Referer request-header allows a server to generate lists of back-links to resources for interest, logging, optimized caching, etc. It also allows obsolete or mistyped links to be traced for maintenance. The Referer field MUST NOT be sent if the Request-URI was obtained from a source that does not have its own URI, such as input from the user keyboard. Basically, when a user’s browser is requesting a page on your site it can supply this “Referer” field, which is then accessible to Google Analytics. GA reads and parses the value of the field, processes it and then displays it in your Source / Medium report. 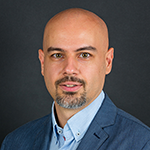 Make note that this field is not mandatory and also that it “MUST NOT” be set in case the source doesn’t have a Unique Resource Identifier (URI). This will be important in just a second. What is Direct traffic in Google Analytics then? The second thing you need to know in order to understand what direct sessions really represent is how Google Analytics attributes traffic to traffic sources and mediums. If you have a deeper interest in the subject I highly recommend getting yourself acquainted with the processing flow chart at the bottom of this page from the Google Analytics help center. Here is the short version of it: GA will check for: AdWords auto-tagging, UTM campaign tagging parameters, and the HTTP referrer field we just discussed, in that order. If none of these are set AND if there is no prior campaign data associated with the user’s browser (ID is clientId in the _ga cookie), then Google Analytics will mark such traffic as… wait for it… direct / none . Direct traffic is traffic for which the referrer is unknown and for which no prior campaign data could be found for the cookie (user). So direct traffic is not direct at all, it’s just unknown, undefined. Google has no idea if your user typed in your URL, if they used a bookmark or if something else happened. Let that really sink in and to help that process, let us see in what other cases the user’s browser will not set the “Referer” field. User clicks on a link in a PDF, DocX, ODF, XLSX or a different type of document. As you can easily see, there is a plethora of very common cases in which a user will NOT type in your URL and will NOT be using a bookmark and still be tracked as direct traffic in GA. That’s why I think “unknown” is a much better term. Most of these are related to other applications forcing the browser to open a link, but in the case of https to http we actually have users coming from another site who are still not tracked as proper referrers. That’s because in the case of SSL to Non-SSL the browser is required to not pass the referral information. Now that we know what direct / none really is, let’s see what we can do understand it better and gain some insights. There are two things you can do in order to see in the black box that is direct traffic. The simplest thing you can do immediately and retroactively is to just take a look at your landing pages breakdown for the direct / none source/medium dimension. Are people landing on pages that are only accessible to logged-in users? Are they landing on pages that you’ve used in e-mail campaigns or system/operational emails? Are they landing on pages to which you have links in your desktop or mobile software (if you’re a desktop or mobile software company). As will be the general case – most direct traffic arrives at the homepage, however, we have big amounts of it landing on various tool pages, our prices page, login page and at our account activation page. You can see the % new sessions metric is being very helpful in this case – it varies greatly between landing pages, suggesting very different types of traffic are landing on them. If you are a more advanced user you can use the landing pages to define Custom Segments, Custom Channels, and Custom MCF Channels in order to get better idea of the different types of traffic from unknown sources. This is something you can do for direct traffic that you control: emails of all kinds, links embedded in desktop software or mobile apps, links in materials distributed as PDFs or other types of documents, affiliate links, etc. By tagging your links you’ll supply Google Analytics with the referral data you want. You can use Google’s URL builder tool or our own Advanced URL Builder to assist in this task. However, this will only apply for traffic going forward, so if you want to analyze prior direct sessions see solution #1 above. As you can see, understanding direct traffic is not the easiest thing, but it’s not that hard once you have a bit of technical background. If you like this article, let me know, as we are planning on releasing a series of these more educational articles in the very near future. Updated Aug 3, 2017: clarity and style improvements. This entry was posted in Google Analytics and tagged direct sessions, direct traffic, google analytics. Bookmark the permalink. Both comments and trackbacks are currently closed. That’s an interesting issue to check – most apps won’t do it, but there are ways, as you mention. how about an article about using utm tags internally to track landing page to target destination page? That’s a practice I strongly discourage for various reasons. There are better ways to accomplish such tracking and I might do an article on that at some point. Great explication. Wonder about this traffic type since I started SEO, Very informative and useful post for us. Thank you so much for the blogs. Any Idea what the difference is between “Unknown” and “Other” as I have both showing in my analytics. Also, does facebook.com show up anymore since it is HTTPS? My website is http and I’m not sure if some of the “Unknown” or “Other” is from Social Media Pages or even Google since Google is also secure? So if you are using a URL shortner, should you include tagging parameter in the URL you are shortening? For example… all of your social media posts, Twitter, IG, email campaigns, etc.. If you want Google to generate accurate reporting…URLs must be tagged properly? Great article – now the direct traffic makes much more sense.